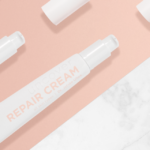 Due to high demand the Repair Cream is temporarily sold out. We will distribute a newsletter as soon as the product is available again. If you are not yet subscribed to our newsletter, please sign up for it here. Does your skin (sometimes) struggle? Are you, for instance, prone to irritated skin in the winter? Does your skin feel very dry during a flight, in the swimming pool or from air conditioning? This rich Repair Cream helps the impaired barrier layer to recover quickly. The full cream contains a unique combination of substances, such as ceramides, cholesterol and free fatty acids, which occur naturally in the lipid layer of the skin barrier. Thanks to the right combination, the substances can also be absorbed effectively. Alongside this, extra added ingredients, such as oat extract, panthenol and squalane, help the skin heal and offer protection and relief from irritation, itching and inflammatory responses. The Repair Cream is the perfect accompaniment to the Moisturizer. The full cream is suitable for the face and body. It can also be used as lip balm, hand and foot cream. The product goes on smoothly, absorbs in well and doesn’t leave a shine. The Repair Cream is, in fact, a real First Aid Cream which you should never be without. 1. What is so special about the ingredients used? To begin with, the Repair Cream contains a unique complex of ceramides, cholesterol and free fatty acids. These substances occur naturally in our skin, where they form the protective fat layer of the epidermis. Ceramides make up the key players here. A shortage of these ceramides leads to an impaired skin barrier and dehydration. As we get older, the amount of ceramides naturally decreases. But in conditions such as psoriasis and eczema, the level of ceramides in the skin is also low. In order to replenish the supply of ceramides, it is important that the substance can be absorbed properly. Therefore a good balance of ceramides, cholesterol and free fatty acids is necessary. The Repair Cream contains the right combination of these important skin’s own fats for rapid recovery of the skin barrier. The cream not only owes its fast repairing ability to these lipids, but also, in particular, to its combination with some other very resilient ingredients, including an effective oat extract, phytosphingosine and panthenol. That makes it a versatile product. 2. When do I use the Repair Cream? The Repair Cream is a super product to put on dry or irritated skin. The rich, healing cream is suitable for the face and body. The product absorbs easily into the skin and gives a silky smooth feel. 3. How often do I use the Repair Cream? You can use the Repair Cream as often as you like. You can apply the cream in the morning, but also in the evening before going to bed, on top of the Moisturizer. Try and look at the needs of your skin. Does your skin feel dry and tight in the winter? Do your lips or hands suffer? Then apply some before you leave the house, and don’t forget to carry the product in your bag. The Repair Cream is also a great product for on the ski slopes, during a bracing beach walk or on the ice. 4. How do I use the Repair Cream within the 5-step plan? The Repair Cream is what we call Extra Care for the skin. You use this full, repairing cream on (parts of) the skin which can (temporarily) do with some extra care and protection. For instance, on dry patches. Or for the hands and lips. Do you use the Repair Cream on your face? Then apply it after the Moisturizer and, if necessary, the Suncare. 5. Is the Repair Cream also suitable for young skin? As we get older our skin changes, and along with this the needs of our skin. The more mature skin is thinner and therefore often more dry. Furthermore, the antioxidant supply dwindles with the rising years and, whereas the ceramide levels are still at 100% in your twenties, by the time you reach fifty they have dropped to 37%. Having said that, a young skin can also be dry and damaged, just as a mature skin can suffer from spots. In order to choose the correct care it is therefore important to look at the skin, rather than just at the age. The Repair Cream is also very suitable for children. 6. Is the cream actually suitable for the more oily or unsettled skin with spots? The more oily skin has, in principle, no requirement for an extra rich cream. For unsettled skin with spots (which may also be dry) it is wise to first test the cream on a small part of the face. 7. How beneficial are oats for the skin? Oat is one of the few natural ingredients which is recognised by the FDA as a ‘skin protectant’. Oat is in the same group as glycerine, allantoin, dimethicone and petrolatum. Oat can (temporarily) protect the skin, relieve irritation and ease itching from skin rashes, eczema, insect bites and toxic plants (such as stinging nettles or oak). The Repair Cream makes use of an extract of the oat (avena sativa kernel). This extract is very effective.